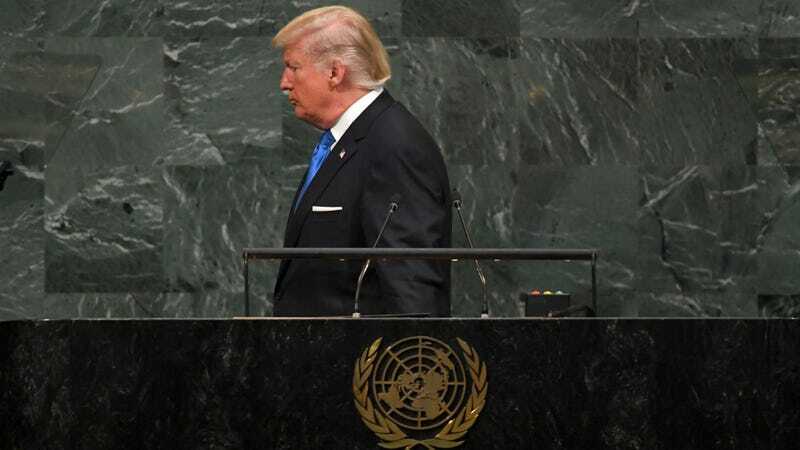 President Donald Trump visited the United Nations headquarters in New York City earlier today, where he kicked off his first address to the organization’s General Assembly—founded in 1945 with the stated aim of preventing future world wars—by making the kind of statements that could very well start another war. In the speech, written by Stephen Miller, Trump said, “Rocket man is on a suicide mission for himself and his regime,” in reference to North Korean leader Kim Jong-un. (He used that same nickname for Kim in a tweet a couple of days ago.) He went on to threaten that “we will have no choice but to totally destroy North Korea” should the U.S. have to defend itself against the rogue state. He then pivoted to Iran, which he called an “economically depleted rogue state” and a “murderous regime” and questioned the U.S.’s 2015 nuclear deal with the country. In typical Trump fashion, he sandwiched these threats in between praise for himself—he specifically said the stock market’s been on the rise since his election, when it’s been rising since 2009—and invocations of “radical Islamic terrorism” and “uncontrolled migration.” In related news, “Rocket Man” is now trending on Twitter, and we are so incredibly fucked.